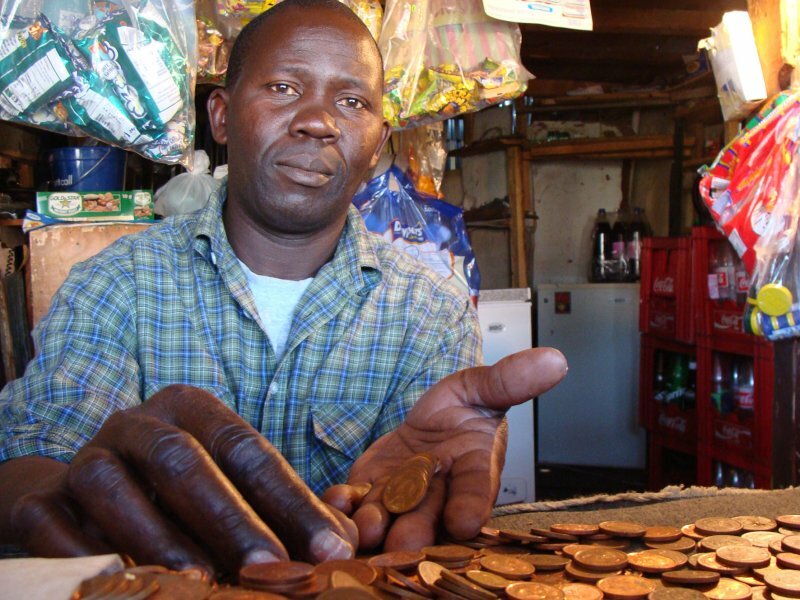 Many businesses in Cape Town’s townships refuse to accept payment with five cent coins. But one clever shop owner who doesn’t mind counting out small change is coining it. Mathews Mashaba, who owns Niki Naks spaza shop in Du Noon, has a sign outside his shop which reads: “We do take 5c here you can buy any stuff you want”. And he says as a result, customers have been flocking to him as other shops refuse to deal with their small change. Mashaba said he doesn’t even mind if customers buy their groceries with plastic bags full of five cent coints. He said he decided to put his sign up outside his shop three months ago and business began to pick up. “My business is growing. People used to throw away their five cents, now they bring them to my shop. They buy anything from airtime, bread, sugar, almost everything,” said Mashaba. Somali shop owner Ali Kaka admitted that he refused to take five cent coins from customers, the smallest coin he would take was ten cents. “Customers refuse it (five cents) when we give them change, they throw it away. That’s why we refuse it also when they want to buy,” said Kaka. But resident Mandhlomo Ndamane said it was upsetting when he went to the shops with five cent coins and then have them refused. Another upset resident Mavis Makubela said five cent coins were not accepted in Du Noon shops meaning that “we throw our own money away”. “When you buy something for R9.95 and pay R10.00 they give you five cents change but when we take it back adding on more money to buy something they don’t accept it, we don’t like it. We throw away our own money,” said Makubela. SA Reserve Bank group communication and strategy head, Hlengani Mathebula said all money in circulation is legal tender and that there was no reason why businesses should refuse to accept it. Mathebula said if consumers supplied the Reserve Bank with the names of businesses that refused five cent coins they would take action. “Any money that has been issued by the reserve bank is a legal tender no business has a right to refuse that money,” he said. — Peter Luhanga, West Cape News.